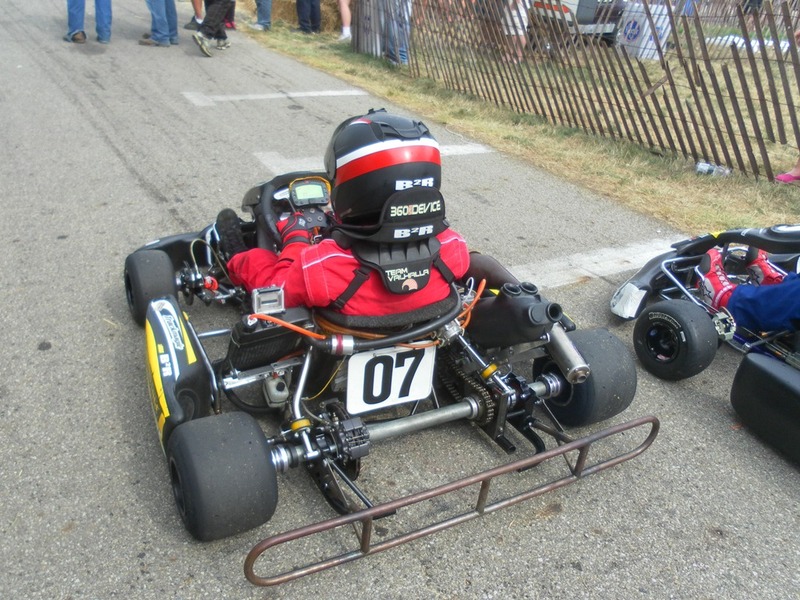 NEWS – After a very enjoyable and rewarding one-off Commercial Point Karting Classic, Bruce Brothers Racing managed to regain some of the form we showed in club racing during the beginning of the 2012 Mid-State of Ohio Kart Club season. Both boys had some difficulties during MSOKC Race No. 9, which was a reverse direction event at Circleville Raceway Park, but the end result was much more satisfying than other recent club racing results. 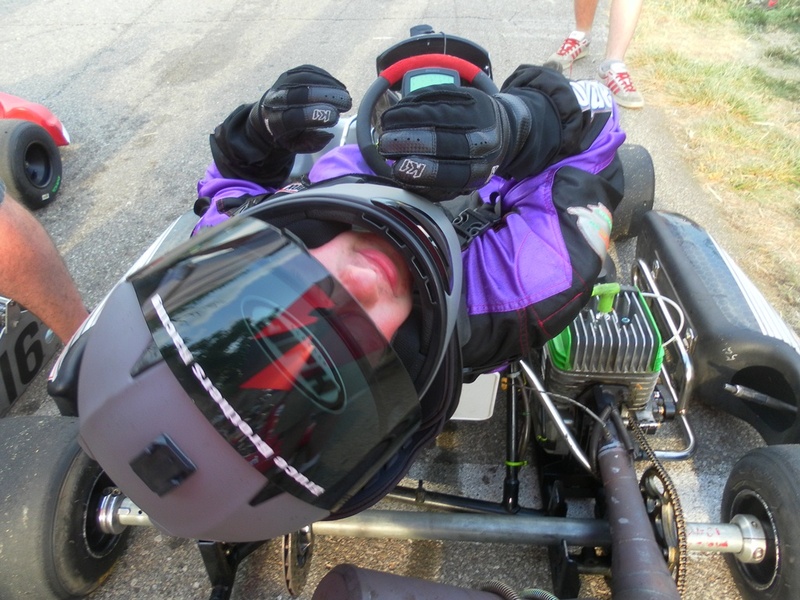 PRACTICE – After the CPKC, the setup on both karts had to be changed back to suit CRP – mainly gear ratio changes, a return to club-spec tires, and an axle change for Peter’s kart. The intermittent ignition problem on Peter’s kart seemed to have been resolved during the CPKC by using a borrowed, used ignition unit. I was subsequently told that these units either work or they don’t, and since Peter’s old one still worked, we elected to stick with it instead of buying a new one. During practice, it worked just fine. Both boys enjoy reverse direction events at CRP and both recorded competitive lap times during their practice sessions. 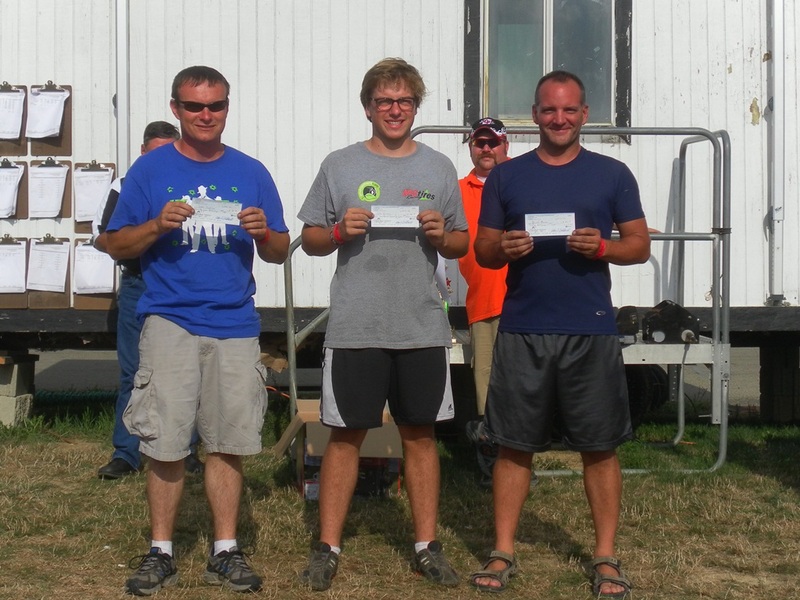 SPEC 100 PIPE – There were only four karts in Peter’s class for Race No. 9, and only three of those were regular competitors. The random draw for starting positions had Peter starting from fourth in the first heat and first in the second heat. In his first heat, Peter made a pass for third on Lap 2 and a pass for second on Lap 6. He was not quite as fast as the eventual winner and finished second. In his second heat, Peter maintained his position at the start and drove a very smart race for a heat race win. He was not quite as fast as the second place kart (the winner of the first heat) but managed to keep the lead without blocking. A second and a first earned Peter pole position for his feature race. During the break, we made a few changes to the rear axle to improve on what Peter described as “binding up” in the corners. Peter maintained the lead at the start of his feature, but it became immediately apparent that the problem was not resolved. He managed to hang on to the lead for the first few laps, but then had to surrender it on Lap 4. The other two karts passed Peter as the problem continued to worsen, and Peter pulled into the pits before the checkered flag. The non-regular competitor waived post-race tech inspection, so Peter was credited with a third place finish. 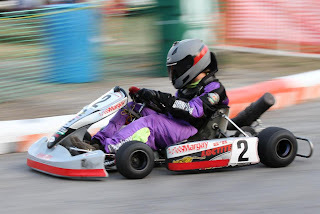 80cc SHIFTER – Similar to Peter, Conor started from the rear in the first heat and towards the front in the second, but there were 12 karts in his class for Race No. 9. A lot can go wrong during a standing start with 12 karts, so Conor took it easy at the start of his first heat. He dropped a position at the start (from 10th to 11th) in the first corner (Turn 10 for reverse direction events), but was able to gain three in the next corner when three karts tangled. He made a good run onto the back straightaway on the first lap and picked off another kart in Turn 4 for seventh. In the same corner on the next lap, two other karts tangled in front of him. This time, Conor had no place to go and had to come to a complete stop and get out and push before he could continue. This dropped him to 11th. It took him five laps, but he caught up and passed one kart on Lap 7 and another on Lap 8 for a ninth place finish. He set the fastest lap of the race (45.281 seconds) in the process. From the third starting position in his second heat race, Conor maintained his position at the start, made a pass for second on Lap3, and another for the lead on Lap 6. A ninth and a first somehow managed to be good enough for pole position for the feature. Conor made a great start, led every lap, and recorded the fastest lap in the process. This was our first MSOKC feature race win since Race No. 5 on June 17, 2012. NEXT RACE – It sure was refreshing to get at least one kart back on the top step of the podium (see picture in an earlier post here). After the feature races were over for the day, we reverted to the previous rear axle set-up we had on Peter’s kart and sent him out for a few test laps. From the sound of the engine, you could tell that the problem was still there. We then changed the ignition unit to the one we used for the CPKC and sent him out again – and it worked just fine. What Peter thought was the rear axle binding up in the corners was a slight misfire when the engine was under heavy load. Unfortunately, the information I got about the ignition unit was apparently incorrect. We will be buying a new one for MCOKC Race No. 10, which is Sunday, September 9, 2012, at CRP. This event will feature qualifying instead of the normal heat race format to allow time in the afternoon/evening for the annual MSOKC Hog Roast. There will be plenty of food for everyone, a variety of games, and a Powder Puff race in the rental karts for wives, girlfriends, and mothers of the regular racers. p.s., Lap times, lap charts, and results from Race No. 9 can be found here. The trophies are impressive, but they're actually props. One of the club members used to race sprint cars and began bringing these old trophies to improve the appearance of the podium ceremony. Here are three additional pictures of Conor during his pro race courtesy of Chad Gilsinger (click to enlarge). NEWS – The outcome of the 2012 Commercial Point Karting Classic (formerly the Commercial Point Grand Prix) last weekend was nothing but spectacular for Bruce Brothers Racing. 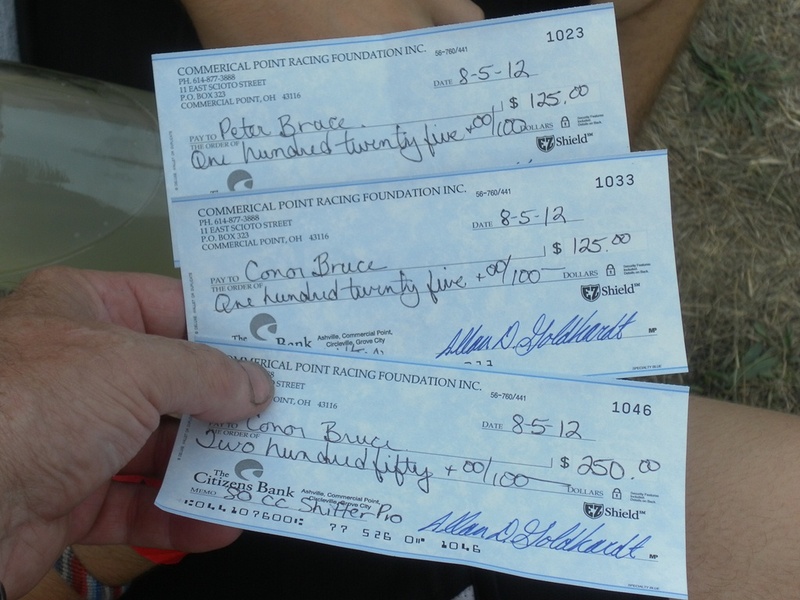 Between Conor and Peter, they were entered in five races during the two-day event – and they won all five of them. There is no doubt in my mind that they were guided by the spirit of my mom, Martha Bruce, who passed away Saturday morning. She was their inspiration and she kept them safe throughout the weekend. She was one of the biggest supporters of our racing endeavors since we began. As her health deteriorated over the past few years, her ability to attend the races diminished. She had become extremely ill in the months and weeks leading up to the CPKC, and in the days leading up to the event, the projections for the end of her time here on Earth went from days to hours. She would not have wanted her condition to prevent us from participating, so we loaded up on Friday and headed to Commercial Point on Saturday morning. It was not long after we unloaded the trailer that we got the telephone call that she had passed. We called upon some of the many good friends we have in the racing community to look after our equipment while we went to pay our last respects. It was good to see her body resting peacefully after such a long and painful illness. Even when you know it’s coming, it’s a huge loss when it does. 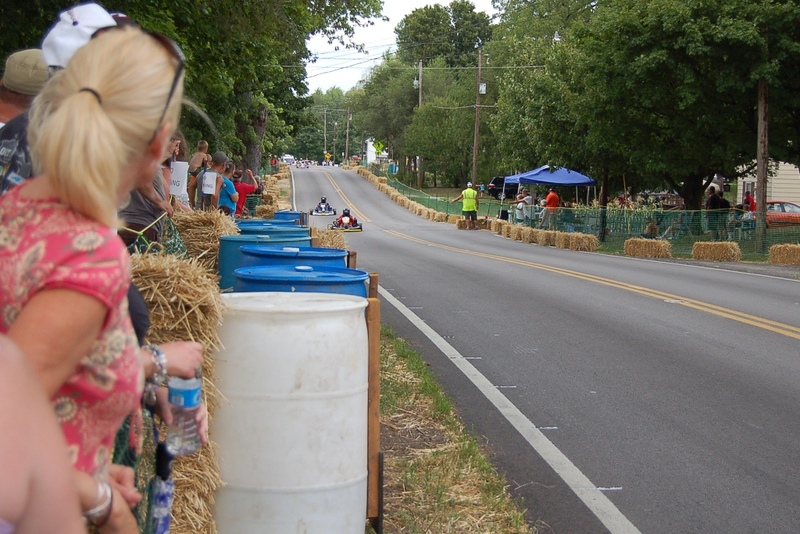 PRACTICE – The CPKC, like the CPGP before it, is a street race through the village of Commercial Point, Ohio. The track layout changed significantly since last year’s event, so the practice sessions were extremely important – not just in terms of the drivers learning the new layout, but also for finding the optimum gear ratio, chassis setup, etc. 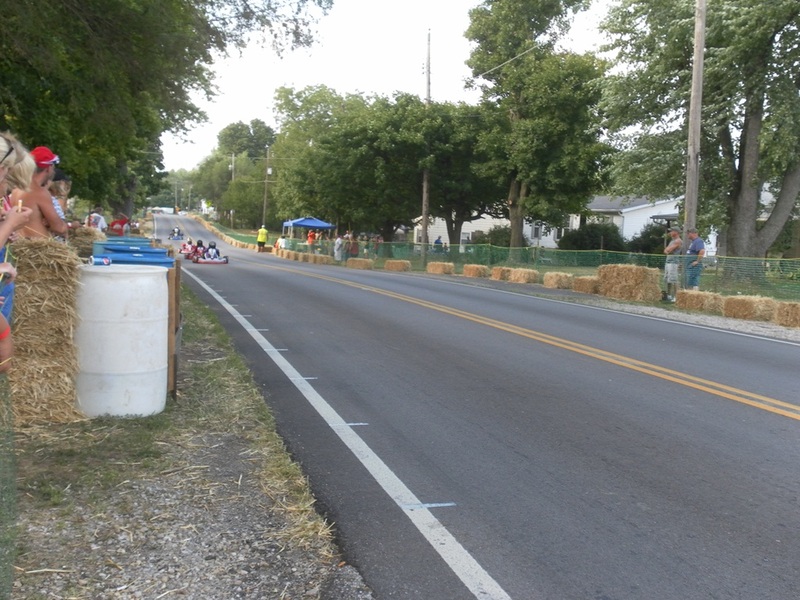 The new configuration features a longer front straightaway, a chicane through a church parking lot, quite a bit of new asphalt, and a new system of track-side barriers (a combination of water-filled plastic containers and straw bales). We returned to the track just in time for the boys to attend the driver’s meeting prior to the first of two practice sessions. The best times from the second session were supposed to determine starting positions for the qualifying races later on Saturday, but timing and scoring system was not working properly, so the organizers reverted to a random draw for qualifying race starting positions. During practice, both boys ran well and we had to make very few changes to the setup that we determined to be necessary for the new configuration. I was confident that both boys would have qualified up front based on practice times, but I was concerned about where they would end up in the random draw. Finishing positions from the qualifying races determined starting positions for the feature races on Sunday, so it was important to start the weekend near the front. Martha must have been looking out for them, because, of the eight karts in Peter’s class and the 12 in Conor’s, they drew the second and third starting positions, respectively. SPEC 100 PIPE – There was a lot of discussion about gear ratio among the competitors in Peter’s class. A ratio that was too high would mean slower starts and less acceleration out of the corners. A ratio that was too low would result in less top speed down the long straightaway. We opted for a ratio at the high end of the range and it worked perfectly. The 12-lap qualifying races were held on Saturday. From the outside of the front row, Peter grabbed the lead at the start. There is a great on-board video that can be found here. The pole-sitting kart (with the camera) dropped to third and caught a great battle between Peter (the No. 2 kart) and the kart in second until the latter caught a wheel on one of the barriers, which resulted in a deflating tire. Peter set the fastest lap on Lap 6 (40.866 seconds) and went on to win comfortably. A win on Saturday meant that Peter would start his 15-lap feature race on Sunday from pole position. When the field came around for the green flag, Peter was nowhere to be found. I would later learn that, on the warm-up lap, it was Peter’s turn to catch a wheel on one of the barrier, which caused him to spin. Because the field wasn’t lined up, the starter gave them another lap, which allowed Peter to resume his position. When the green flag did fly, Peter once again grabbed the lead and began to pull away. An on-board video of Peter’s race on Sunday (including his warm-up lap spin) can be found here. Once the camera kart made a pass for second, he began to reel Peter in. The camera kart stopped just past half distance with a loose carburetor. When that happened, I gave Peter the ‘big lead’ signal and he backed off – a lot. So much so that the next kart in line, which had been behind him by the entire length of the front straightway, began to reel him in. 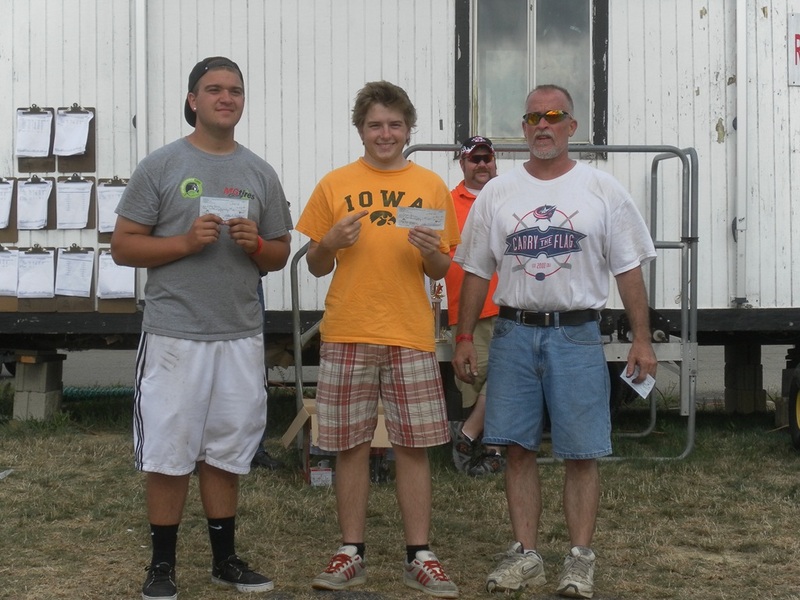 Peter held onto the slimmest of leads at the end for his second win of the weekend. I would later learn that he had clipped the barrier on the outside of Turn 1, which bent his rear axle. We also found a big crack in his exhaust, which caused him to be down on power. With so many things that could have gone wrong but didn’t, it was apparent that someone was watching over Peter. 80cc SHIFTER – We also seemed to have picked a good gear ratio for Conor – one that allowed him to make good starts and have plenty of speed down the front straightaway (just over 70 mph). Conor got away well from the third starting position in his qualifying race on Saturday. He followed the pole sitter through to second in Turn 1 of the opening lap. On Lap 3, the leader pushed too hard going into Turn 1 and spun backwards into the barriers. 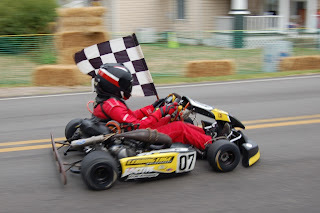 Now in the lead, Conor was pursued by the new second place kart until the latter suffered a broken gear shift lever. Conor went on to win comfortably. 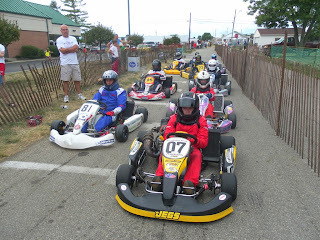 Several of the karts in Conor’s class showed up on Sunday with new tires. 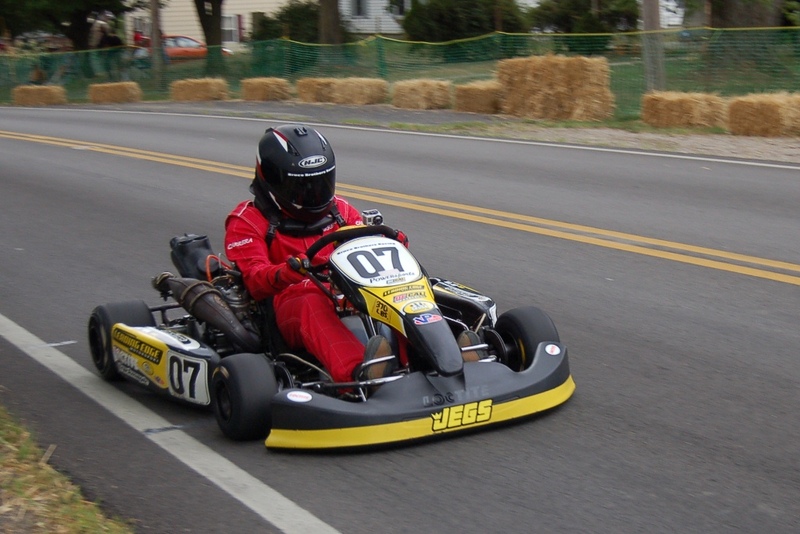 We had opted to put new tires on Conor’s kart on Saturday and hoped that they would last the distance. One of the karts with new tires dropped out on the warm-up lap with a loose wheel. From pole position, Conor made another great start and led into Turn 1. He extended his lead over the next few laps, setting the fastest lap in the process (38.257), and then managed the gap for another comfortable win. 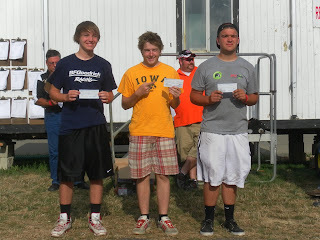 Four classes, including Conor’s, also had the option of entering a 20-lap pro race on Sunday. 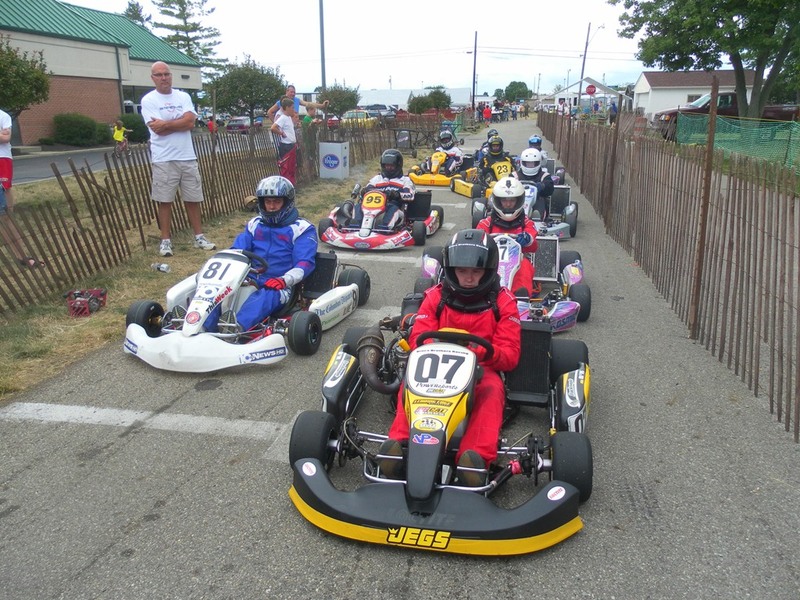 Six karts in Conor’s class, including Conor, lined up for the 80cc Shifter pro race. As the result of his earlier win on Sunday, Conor again started from pole position. By this time, Conor’s tires were well used. The kart that had dropped out on the warm-up lap in the previous race had tires that were still new, but would be starting from the rear. Fortunately, the battle that was shaping up never materialized. Conor made another great start, led comfortably, and then began to pull away. The kart with the new tires put in a few fast lap times, but pushed too hard and spun on two occasions. Conor once again managed the gap for a comfortable win – his third of the weekend. Someone was also looking out for Conor, as after post-race tech inspection, we also discovered a big crack in Conor’s exhaust. Here are some additional pictures of Peter that I found on Facebook (thanks to Jim Kusan). Here are a few pictures from this past weekend (click to enlarge). A full race report will follow. 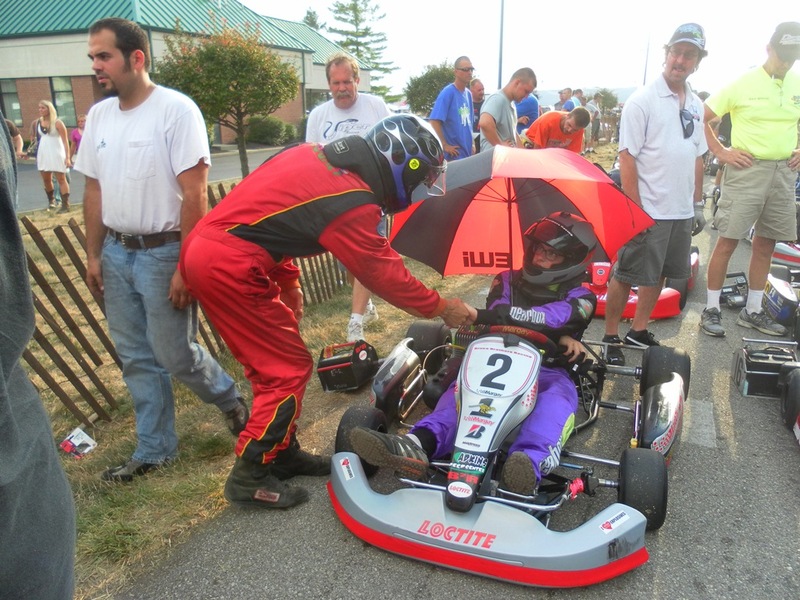 NEWS – After an awesome start to the 2012 Mid-State of Ohio Kart Club season, Bruce Brothers Racing has struggled mightily during the past few events. Between Conor and Peter in the first five events, we scored seven feature race wins. Since then, we have scored none. Our string of misfortune continued during MSOKC Race No. 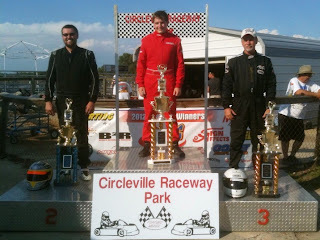 8 at Circleville Raceway Park last Sunday. 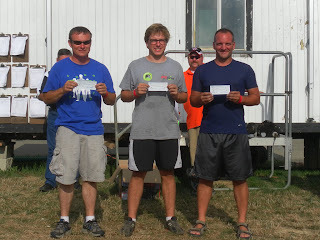 While both boys were fast, both had mechanical issues that resulted in a DNF (did not finish) – Peter during a heat race while leading and Conor during his feature race. PRACTICE – We had quite a bit of preparation to do after Race No. 7, especially to Peter’s kart which seemed to be down on power and then took a pretty heavy hit in the feature race. His engine went in for a rebuild, his clutch was replaced, and various bits and pieces were straightened out. Conor’s kart got new brake pads and both karts got new noses. Peter had a chance to break in his engine on the Friday before the race, which allowed him to focus on race pace during practice on Sunday morning. Conor elected to break in his brake pads on Sunday morning. SPEC 100 PIPE – Peter started his first heat race from the fourth position (of five). He gained a position at the start and another entering Turn 5 on the first lap. He ran in second until Lap 5, when he dropped a position while challenging for the lead. His pace seemed to slow a bit and he lost another position on Lap 7 and eventually finished fourth. Back in the pits, Peter discovered that his brake disk was not lined up between the brake pads. As a result, his brakes were dragging in the right-hand corners. With this fixed, he lined up for his second heat in the second starting position, made a great start and led easily – until Lap 7. With just over a lap to go, his engine died and he had to pull into the grass. It was apparently an electrical problem, because when we replaced the spark plug and the ignition unit, it ran fine. A pair of fourths (another kart had dropped out before Peter in the second heat) resulted in a fourth place starting position for Peter in the feature. It took him just over three laps to move into third, after which Peter set out after the leaders. He reeled them in at about 0.2 seconds per lap, setting the fastest lap of the race in the process (46.760 seconds), but ran out of time in the end. A podium finish (third) for Peter in his feature race would be the highlight of our day. 80cc SHIFTER – Conor had had such a string of misfortune leading up to this event that we talked about just collecting whatever championship points we could without worrying about a win. Okay, so Conor’s first heat race was also a highlight. He started from the second position (of eight), made a nice pass for the lead in Turn 3 on Lap 2, and led to the finish. He also recorded the fastest lap time (45.752) in the process. Starting seventh in his second heat race, Conor gained two positions at the start and another on Lap 2 to bring him up to fourth. He locked his brakes going into Turn 5 on Lap 4 and dropped to sixth. He regained one position on Lap 6 and finished fifth. Conor’s feature race was shortened from 10 laps to six because of a delay necessitated by an incident in the feature race of the Kid Kart class (bumps and bruises, but no broken bones). Conor started in third and nipped at the heels of the leading two, content to pick up a decent haul of points, until the last lap – when his engine died and he had to pull into the grass with an electrical problem. Unbelievably, it was the same problem that affected him while leading the feature race during MSOKC Race No. 6 – the connection from the ignition box to the coil had become disconnected. 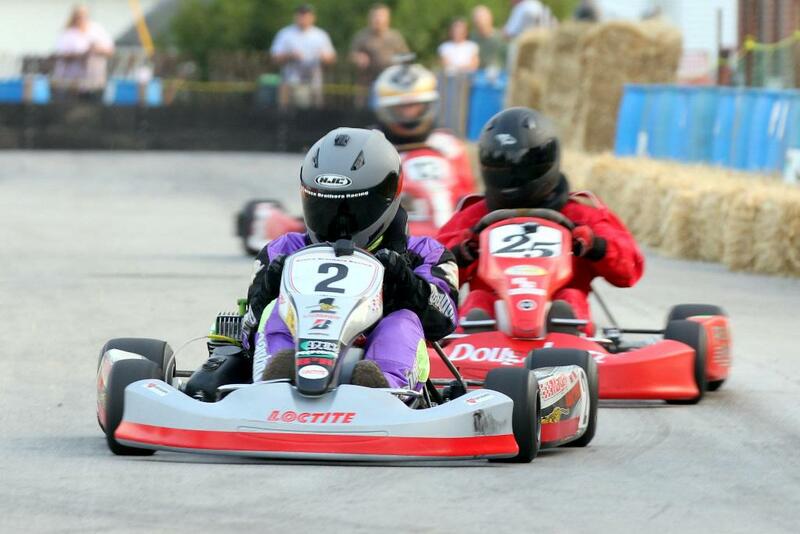 One other kart had dropped out before Conor, so he was credited with a seventh place finish. NEXT RACE – We seem to have the pace to win, but we are ready for a change of pace. 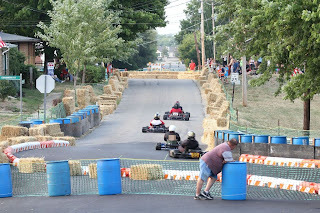 That’s exactly what we’re going to get this coming weekend (August 4 and 5, 2012) at the Commercial Point Karting Classic (formerly the Commercial Point Grand Prix), which is a street race through the village of Commercial Point, Ohio. Peter and Conor will race on both Saturday and Sunday and Conor will race twice on Sunday. The schedule of events can be found here. Admission is free, but passes are required to access the pits. We will be under two beige-colored EZ-Up tents in the pit area near the starting grid. Extra chairs will be on hand for anyone who wants to join us. There will be food vendors, beer wagons, etc. Commercial Point is located approximately 14 miles south of Columbus, just south of Grove City. p.s., Lap times, lap charts, and results from Race No. 8 can be found here.